Philadelphia: Horn Co, 1969. 1.75 inch diameter pin, intrinsic rust stains. 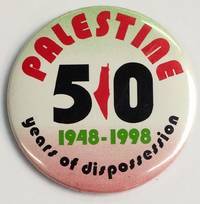 These pins were ordered by a staff member of Vortex, a Lawrence, Kansas underground newspaper, who had them manufactured by the Horn Company, which was then a prominent maker of pins for activist causes. 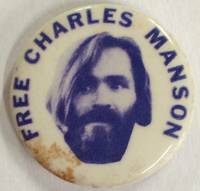 Vortex published an article at the same time these were issued, asserting that Manson had been framed by the government. 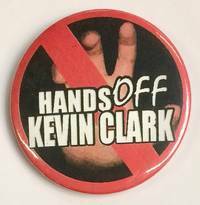 These pins were intended as a fundraiser for the newspaper, though they did not prove very popular. We obtained the final stash from the original Kansas activist, who now feels somewhat sheepish about his advocacy for this particular cause. 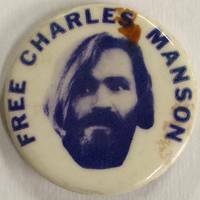 Unfortunately all of the pins are marred by rust stains. 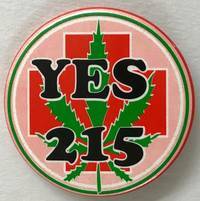 The pin in the accompanying photo is the actual one you will get. [San Francisco], 2013. 2.25 inch diameter pin, very good. Issued after video footage emerged showing San Francisco police beating the 18-year-old African American community college student. n.p., 2008. 2.25 inch diameter pin, very good. Versailles, OH: TigereyeDesign, 1998. 2.25 inch diameter pin, very good. Date and manufacturer on the curl in tiny font. 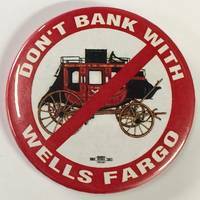 May have been issued after the 1998 merger with Norwest Bank, which aroused controversy. n.p., 1998. Large 3-inch diameter pin, very good, no manufacturer's mark on curl. [Cleveland-? 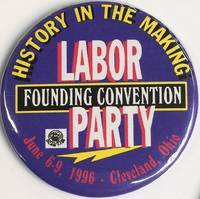 ]: The Labor Party, 1996. Large 3-inch diameter pin, very good. Philadelphia, 1996. 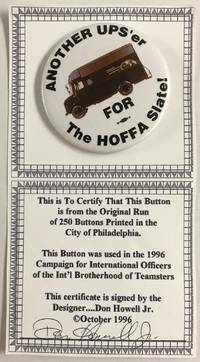 2.25 inch diameter pin, very good, on a card signed by the designer, Don Howell, Jr., certifying that "This button is from the original run of 250 buttons printed in the city of Philadelphia" for the 1996 campaign for Teamster international officers. [California]: n.p., 1973. 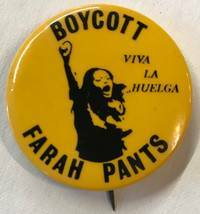 1.5 inch diameter pin, woman with raised fist, black text on mustard background. Very good. 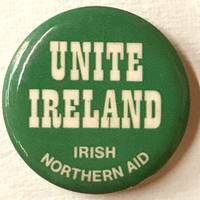 n.p., 1973. Oval button, about 2.75 inches across, subtle dent at right. We find Sarah Jane Johnson III listed as a guest social columnist in Action Magazine. [East Bay, CA]: [UFW], [197-]. 1.5 inch diameter pin with eagle in center, very good. 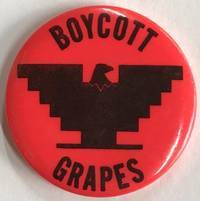 Manufactured by Robert Rush for the UFW. 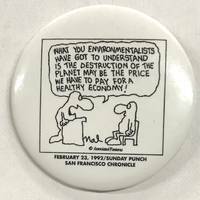 San Francisco, 1992. 2.25 inch diameter pin reprinting the cartoon, which appears to be signed "Mal.". n.p. : UBA, [197-]. 2.25 inch diameter pin, very good, with small image of an African child. 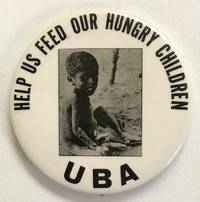 We are uncertain about the identity of the UBA. Venice, CA: n.pub, 1980. 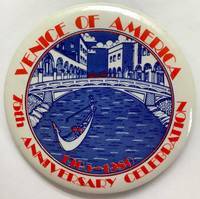 2.25 inch diameter pin showing a gondola navigating a canal, very good. n.p. : n.pub, 1996. 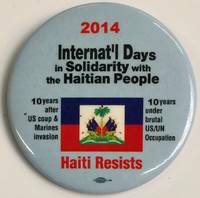 1.75 inch diameter pin, red cross motif. 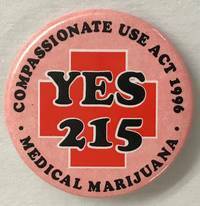 Issued for the Compassionate Use Act of 1996, to legalize medical marijuana. n.p. : KFOR, [200-]. 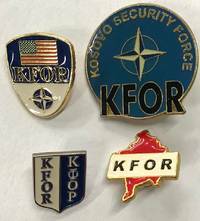 Four different pins from the NATO-led international peacekeeping force in Kosovo. The largest is 1.5 inches across. All are sturdy metal with enamel. [San Jose]: Mfg. by Button King, 1996. 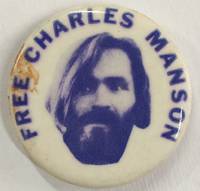 1.75 inch diameter pin, red cross motif. n.p., various dates. 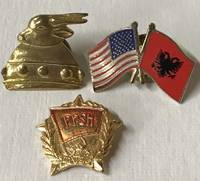 Three different pins: one for the 40th anniversary of the Party of Labour, one depicting Skanderbeg's helmet, and one with US and Albanian flags side by side. New York: Mfg. by NG Slater, n.d.. 1.25 inch diameter pin, very good.